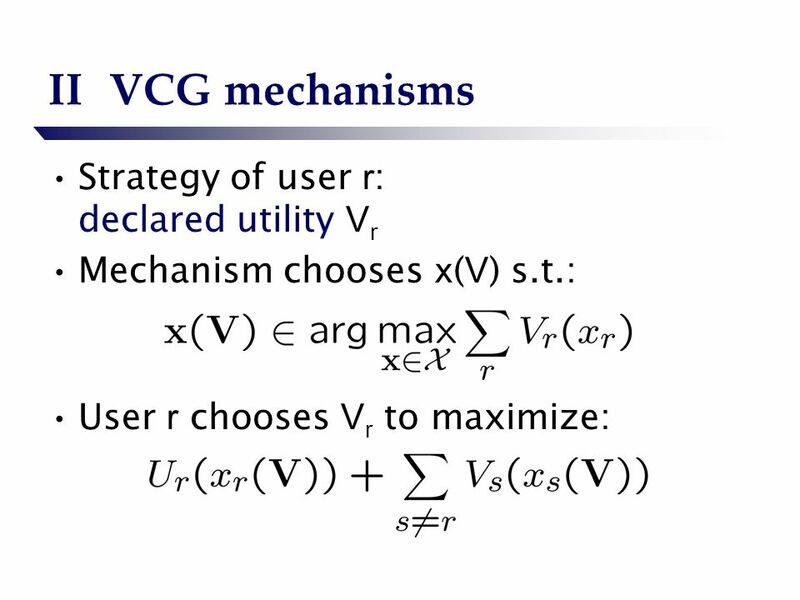 Communication requirements of VCG-like mechanisms in convex environments Ramesh Johari Stanford University Joint work with John N. Tsitsiklis, MIT. 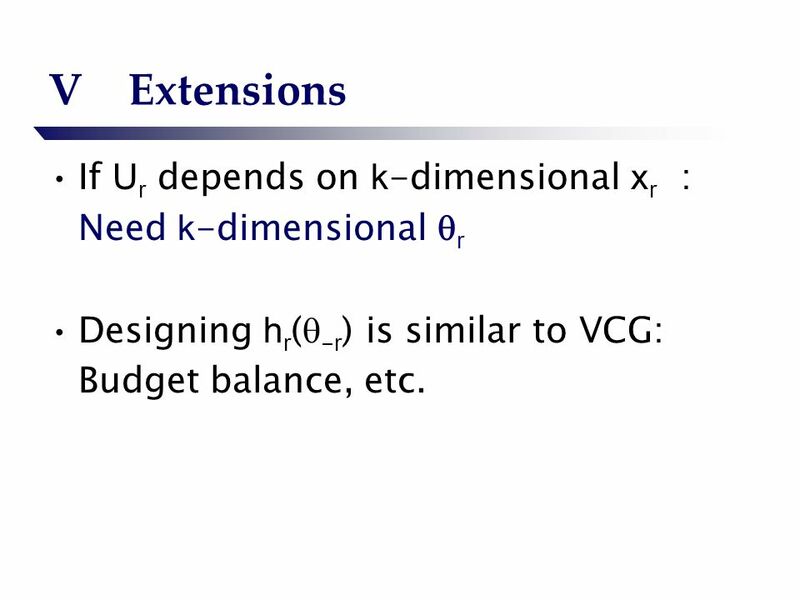 20 VExtensions If U r depends on k -dimensional x r : Need k -dimensional r Designing h r ( - r ) is similar to VCG: Budget balance, etc. 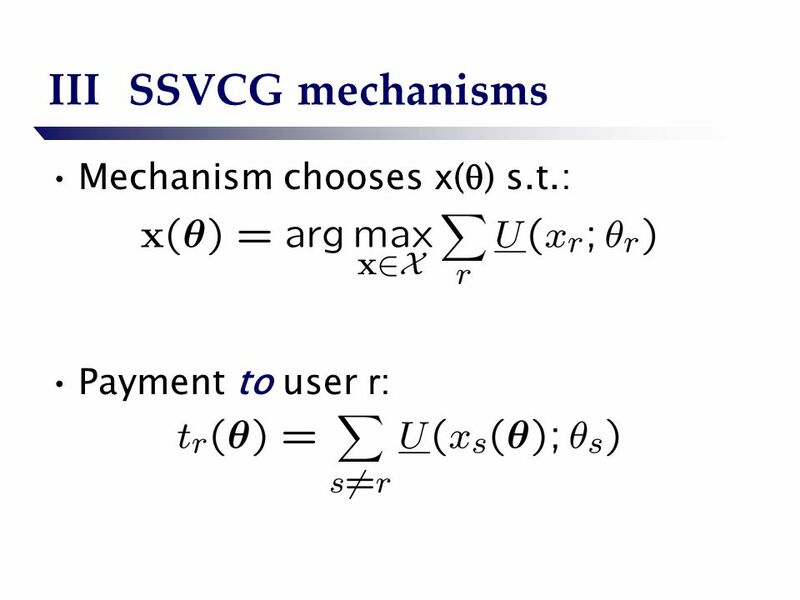 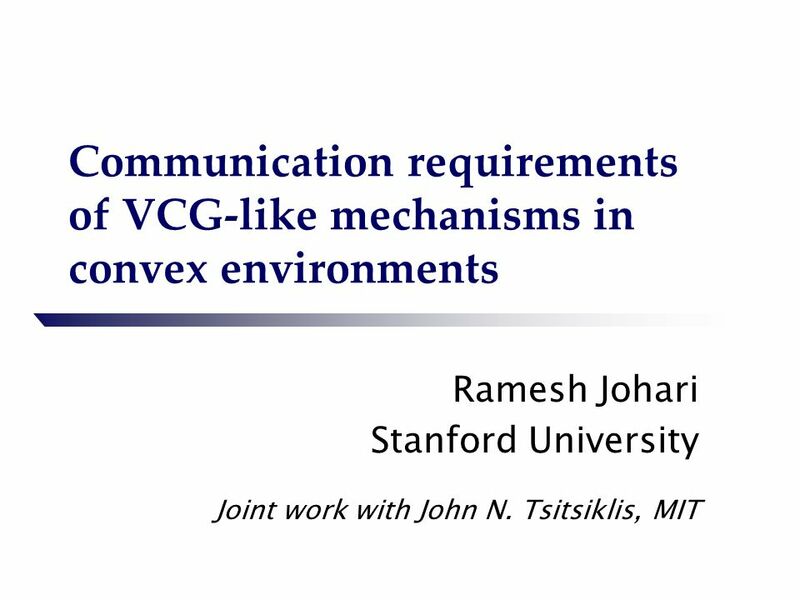 Download ppt "Communication requirements of VCG-like mechanisms in convex environments Ramesh Johari Stanford University Joint work with John N. Tsitsiklis, MIT." 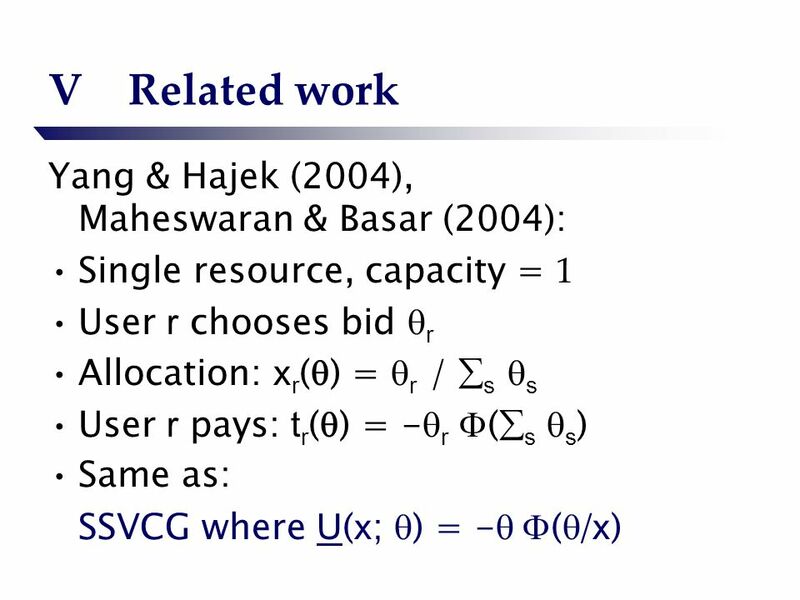 Bidding to the Top: Position-based Auctions Gagan Aggarwal Joint work with Jon Feldman and S. Muthukrishnan. 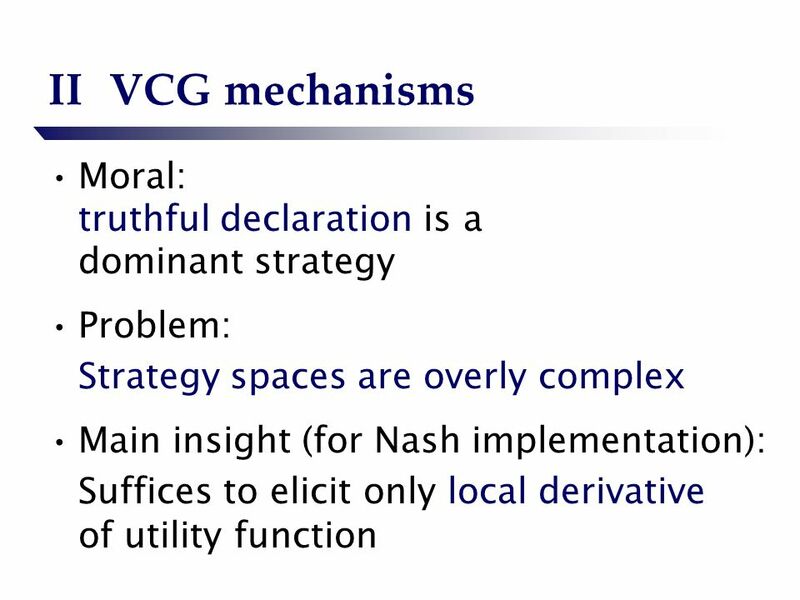 Truthful Mechanisms for Combinatorial Auctions with Subadditive Bidders Speaker: Shahar Dobzinski Based on joint works with Noam Nisan & Michael Schapira. 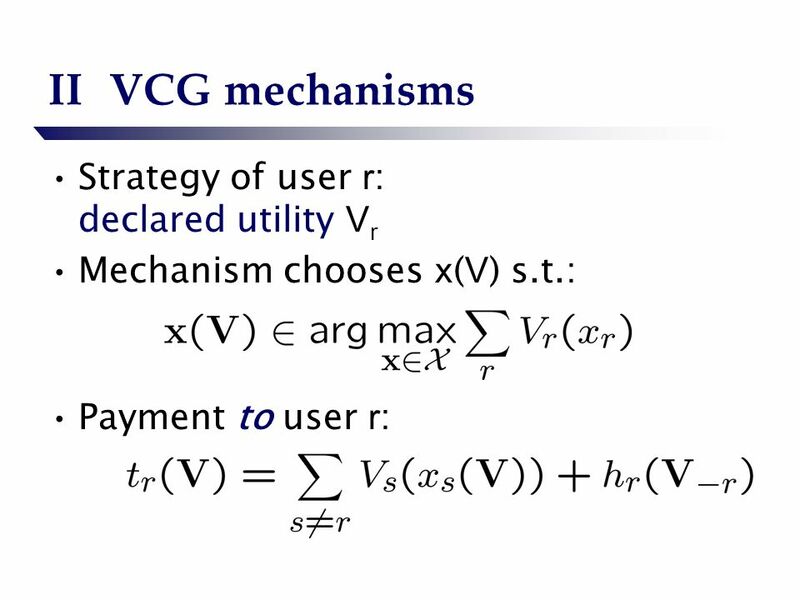 (Single-item) auctions Vincent Conitzer v() = $5 v() = $3. 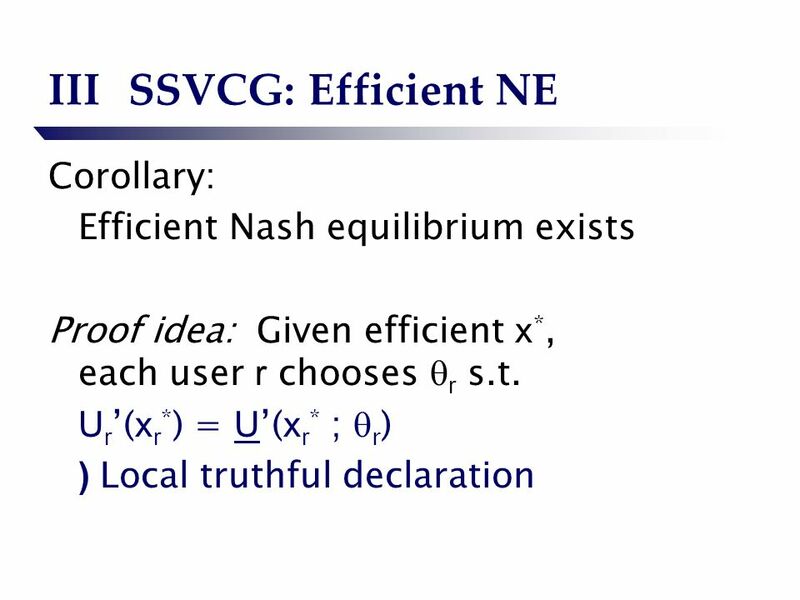 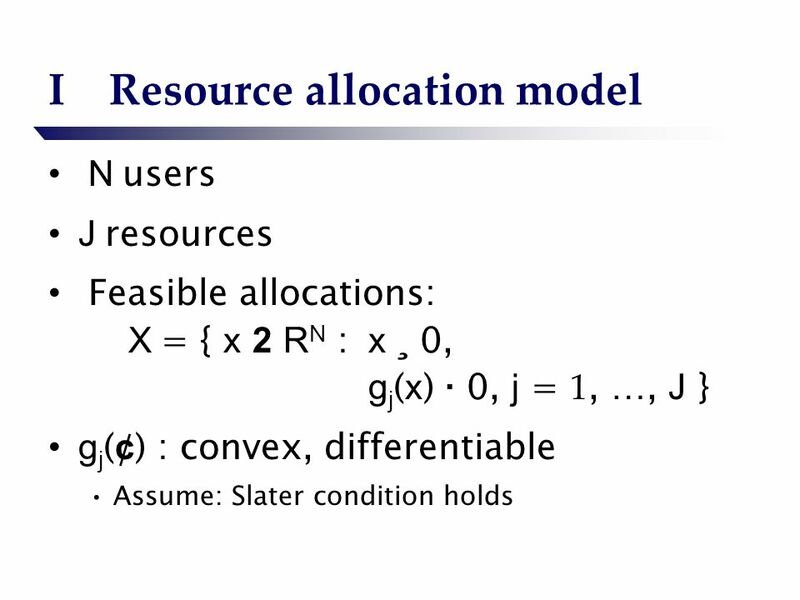 Capacity Allocation in Networks Under Noncooperative Elastic Users Instructor: Ishai Menache Eliron Amir Winter 2006. Slide 1 of 31 Noam Nisan Approximation Mechanisms: computation, representation, and incentives Noam Nisan Hebrew University, Jerusalem Based on joint works. 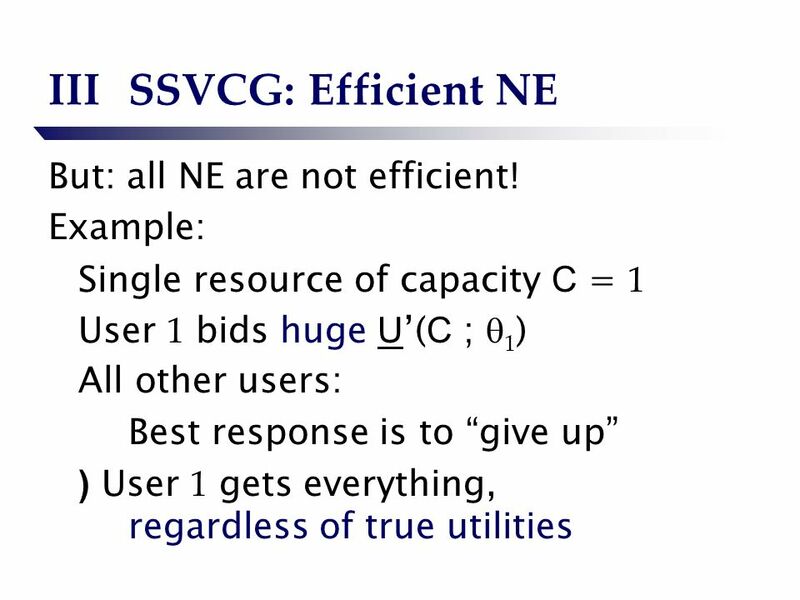 Truthful Spectrum Auction Design for Secondary Networks Yuefei Zhu ∗, Baochun Li ∗ and Zongpeng Li † ∗ Electrical and Computer Engineering, University. 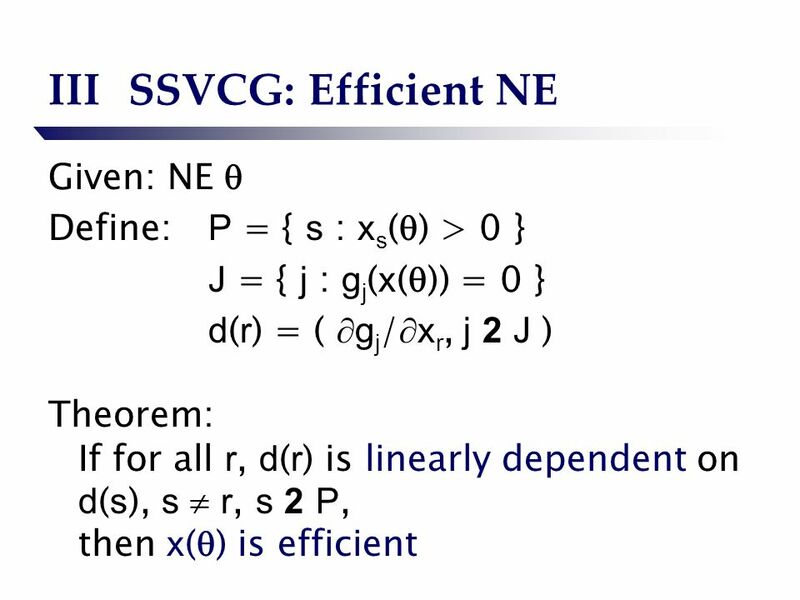 6.896: Topics in Algorithmic Game Theory Lecture 20 Yang Cai. 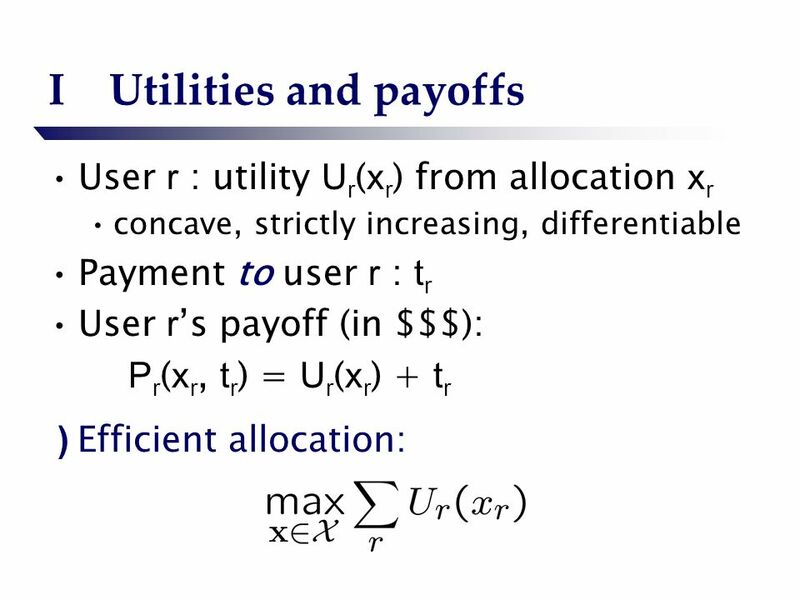 Auction Theory Class 5 – single-parameter implementation and risk aversion 1. 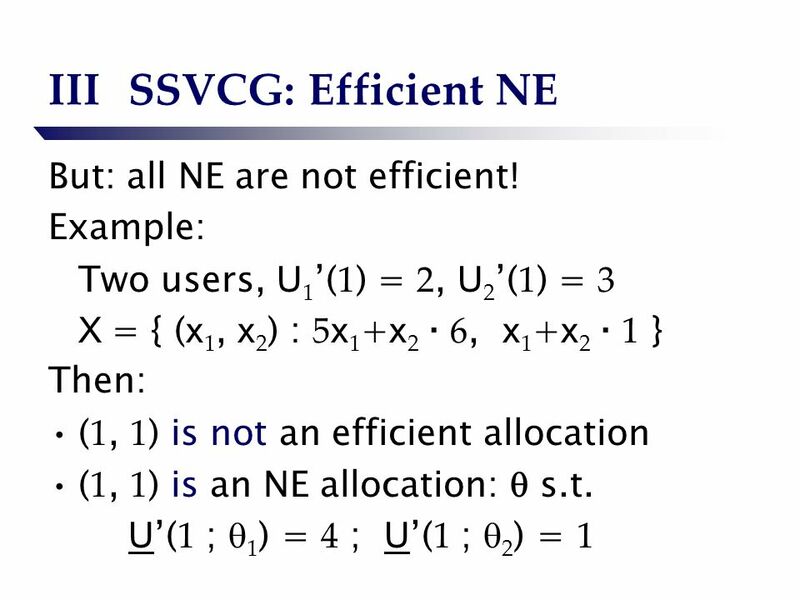 Performance Evaluation Sponsored Search Markets Giovanni Neglia INRIA – EPI Maestro 4 February 2013. 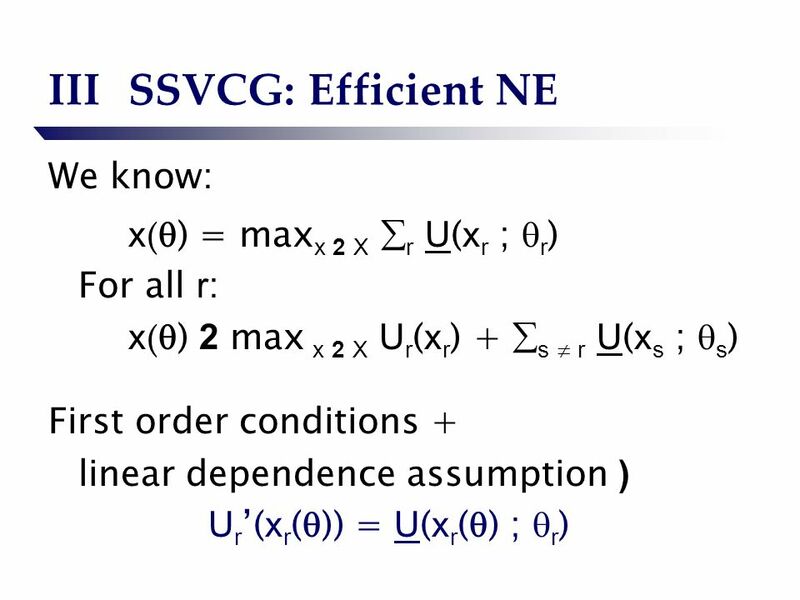 Approximating optimal combinatorial auctions for complements using restricted welfare maximization Pingzhong Tang and Tuomas Sandholm Computer Science. 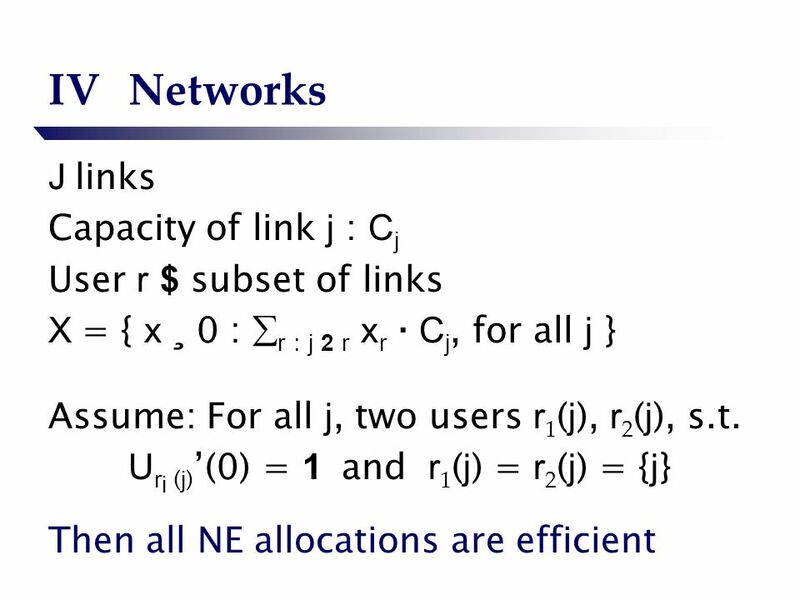 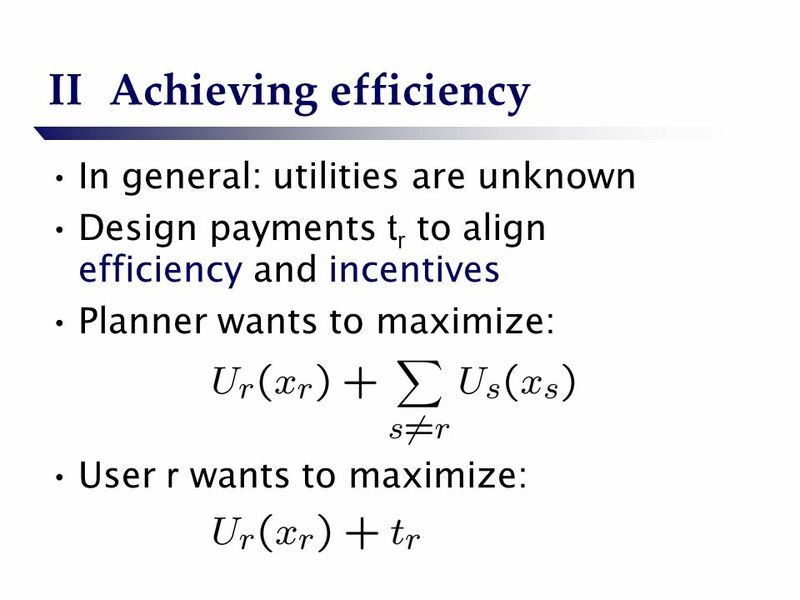 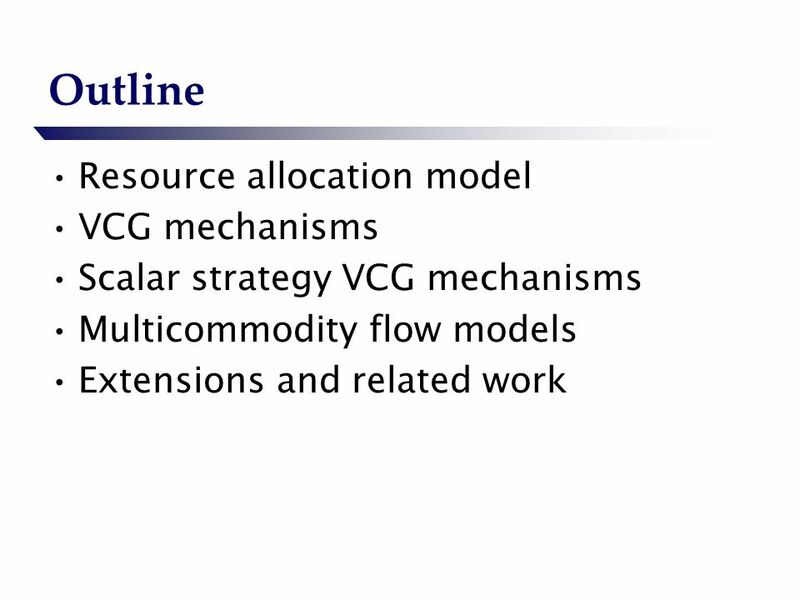 Game Theory in Wireless and Communication Networks: Theory, Models, and Applications Lecture 6 Auction Theory Zhu Han, Dusit Niyato, Walid Saad, Tamer. 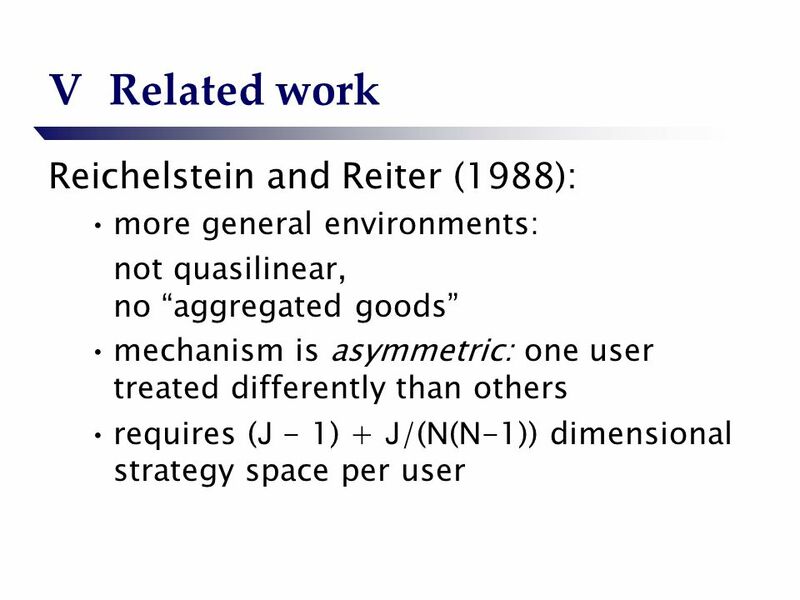 Optimal auction design Roger Myerson Mathematics of Operations research 1981. Sharing the Cost of Multicast Transmissions J. Feigenbaum, C. Papadimitriou, S. Shenker Hong Zhang, CIS620, 4/24. 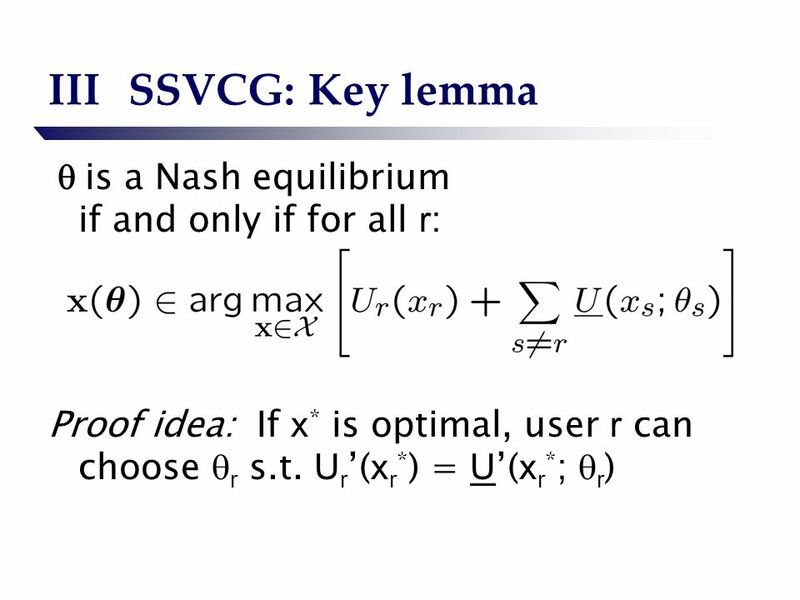 Game Theory 1. 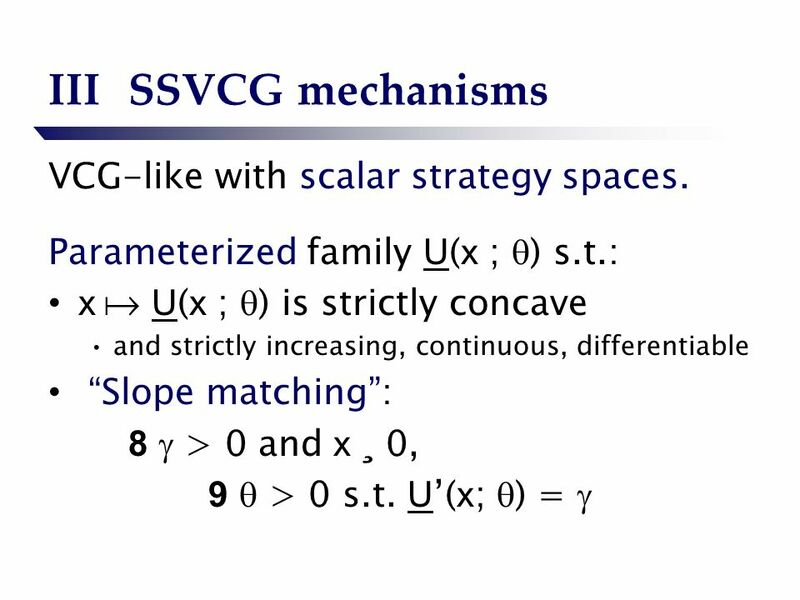 Game Theory and Mechanism Design Game theory to analyze strategic behavior: Given a strategic environment (a “game”), and an assumption. 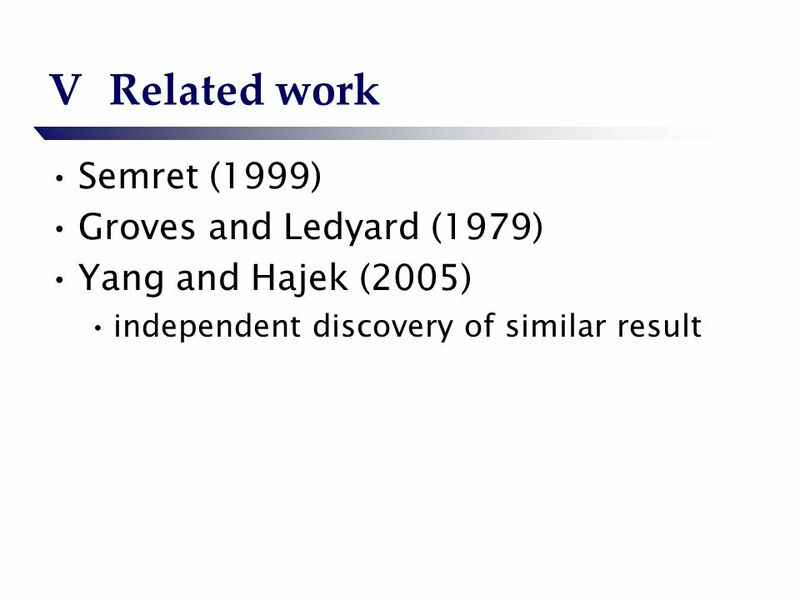 Coalition Formation and Price of Anarchy in Cournot Oligopolies Joint work with: Nicole Immorlica (Northwestern University) Georgios Piliouras (Georgia. 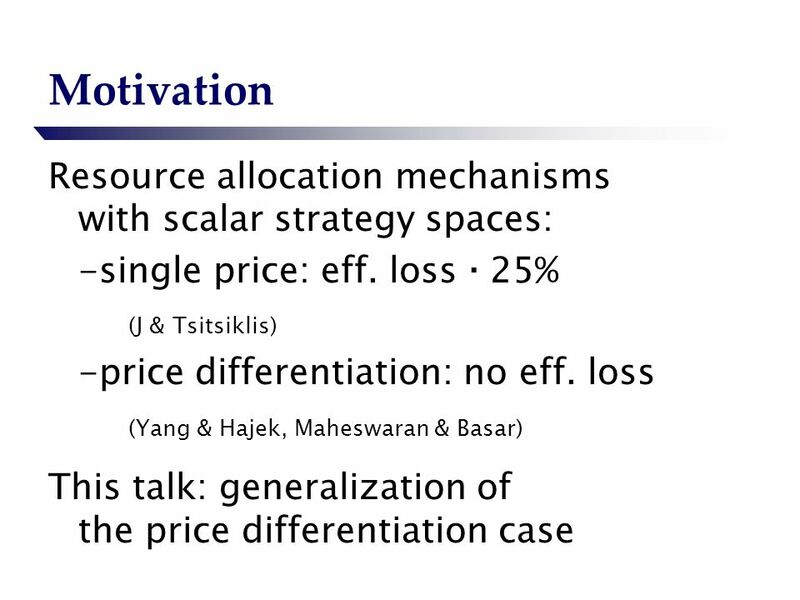 Part 1: Optimal Multi-Item Auctions Constantinos Daskalakis EECS, MIT Reference: Yang Cai, Constantinos Daskalakis and Matt Weinberg: An Algorithmic Characterization.